Do viewers get the royal treatment during the second season of The Crown TV show on Netflix? As we all know, the Nielsen ratings typically play a big role in determining whether a TV show like The Crown is cancelled or renewed for season three. Unfortunately, most of us do not live in Nielsen households. Because many viewers feel frustration when their viewing habits and opinions aren’t considered, we’d like to offer you the chance to rate all of The Crown season two episodes here. 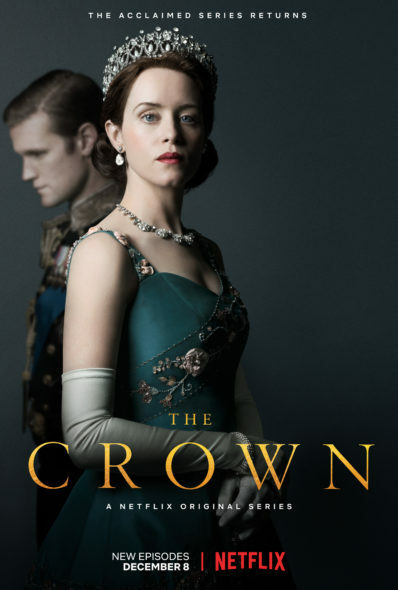 A Netflix historical drama, The Crown stars Claire Foy, Matt Smith, John Lithgow, Victoria Hamilton, Jared Harris, Vanessa Kirby, and Dame Eileen Atkins. The historical drama unfolds during the reign of Queen Elizabeth II (Foy). Inspired by creator Peter Morgan’s 2006 feature film, The Queen and 2013 stage play, The Audience, it centers on two of the most famous addresses in the world — Buckingham Palace and 10 Downing Street — and tells the inside story of power plays, political maneuvers, and love affairs therein. What do you think? Which season two episodes of The Crown TV series do you rate as wonderful, terrible, or somewhere between? Should Netflix cancel or renew The Crown for a third season? Don’t forget to vote, and share your thoughts, below. More about: The Crown, The Crown: canceled or renewed?